Finally, Karolina Pliskova won a tournament, a big tournament, beating CoCo Vandeweghe 7-6 (2), 6-4 in the final at Stuttgart. Over the past few years, the Czech has been pretty close to win a major, but she hasn’t, and now, she feels like that she is back. But with Pliskova, you never, ever know. She is a gigantic hitter, she can smash her forehand and her backhand, and at the net, she can put it away, down low or high up in the sky. Obviously, she is tall, and she will never be super fast, but even last year, she became quicker and more intelligent. Pliskova rarely gets tired, too, because she practices a heck of a lot. Mentally, when she isn’t playing well, she can get very frustrated, and she loses her control. But the No. 6 has matured, so during the rest of the season, she will have a chance to win a major. Maybe at Wimbledon, certainly at the US Open, but actually win Roland Garros? That would be pretty surprising. Yes, she won Stuttgart last week, but it is indoors. She’ll be unprotected and in the elements in the three huge events coming up — Madrid, Rome and Roland Garros. That is harder, as it can be very windy, breezy, hot, cold — you name it. 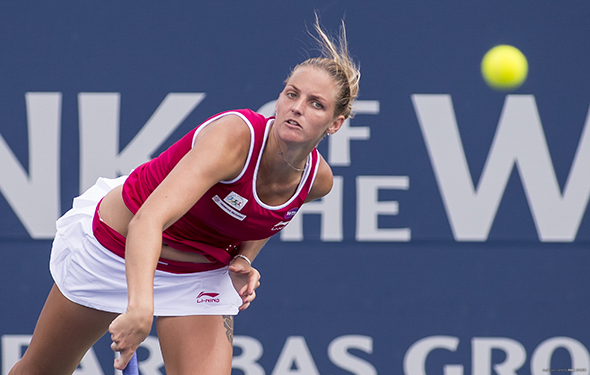 Perhaps Pliskova will prevail, but she has to prove it, as she hasn’t won a Grand Slam yet. At Barcelona, Rafa Nadal crushed Stefanos Tsitsipas 6-2 6-1 in the final. 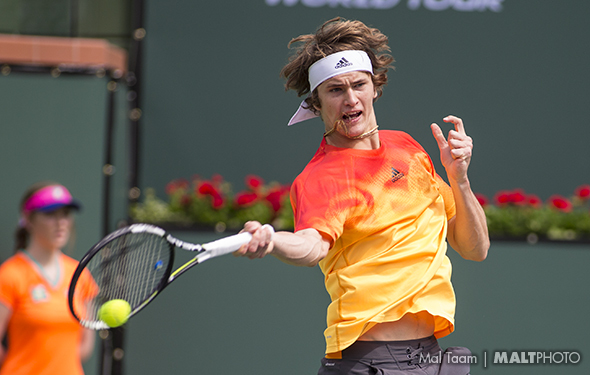 I here that the 19-year-old Tsitsipas is rising, but he has a long way to go. As many people have said, what to say about Nadal, who is dominating on the clay court. He has won 46 matches in a row, and not only that, but he doesn’t even drop sets. It is somewhat surprising, not because he is better than anyone on the dirt, because even three weeks ago, he was still injured. As Nadal has said, that he should have not started on court in January, at a couple of events, because he wasn’t ready to run and swing. Nadal has always wanted to smash the ball, from the time he was young, but now, he is in the early 30s, and over the past five years, he has had to pull out because his body was totally wrecked. Nadal has to be more patient, and diligent, which means that when he goes to Madrid, if he starts to hurt, he should just walk away. Or, if he wins the title in Spain — again — maybe the Spaniard will not play in Rome. In 2013, he won Monte Carlo, Barcelona, Madrid, Rome and RG. That was his best season, so far.But that was five years ago. Right now, yes, he has improved his backhand and he pushes forward, but still, his body is wearing down. We all know that when he arrives at Roland Garros (which he has won 10 times, which is mind blowing, he could get hurt again. And then what? Nadal is a huge favorite, anytime, anywhere on clay, but if he twists his knees, or his back, then he might not be able to raise the trophy one more time in Paris. There have been good matches in Stuttgart, and there are some big pullouts. Over the past three-and-a-half months, there have been the vast majority top women who have played — and competed. The great Williams sisters have been able to play, as has Simona Halep, Caro Wozniacki, Elina Svitolina, Jelena Ostapenkp, Caroline Garcia, Sloane Stephens and Daria Kasatkina, among others. That is a very good thing because over the past 25 years, many of the players have been hurt way too frequently. But now, they are getting smarter, playing less. However, yesterday in Stuttgart, three major players pulled out: the two-time champion Garbine Muguruza, another two-time champion Angie Kerber, and the up and coming 18-year-old, Marketa Vondrousova. In the same day? That is somewhat brutal. That just started playing on the clay, which is actually better for your knees. Maybe it is just bad luck, or maybe they should have pulled out before they came to Stuttgart. Last weekend, many players played in the Fed Cup. Someone won, some lost, but either way, the Fed Cup is one of the most entertaining events of the year. So, after Sunday, and some players were very tired, with messed-up bodies. The answer: pull out before the tournament and don’t get on the plane. What is the point when you are going to lose so quickly? Just don’t come. It is not worth it, for everyone. At least there are two very good players who are still in: Karolina Pliskova and CoCo Vandeweghe. Both of them don’t love clay, but they can both of them literally crush the ball. There is a good piece on WTA’s website about the former five-time Grand Slam champion Maria Sharapova. She lost a tough match against Garcia 3-6, 7-6(6), 6-4. Is Sharapova struggling? Yes, a bit, because over the past year, she has been so-so. Frequent injuries could be the cause. Sharapova is close to becoming more consistent, more patient, more emotionally stable on court. To succeed, she needs to be happy and mentally locked in. Sharapova decided to let go of her longtime coach, Sven Groeneveld, last month, and now she is reunited with Thomas Hogstedt, another long-time coach. Will they stick? Who knows. In a sense, when you are older, the 30-year-old Sharapova really doesn’t need to have a full-time coach. What you really need is to think hard, all the time, focus, whack it, change it up, be super consistent — just breathe. I can be wrong, but one thing I do know is: It’s all in your own head, and no one else can change it. It is all about you, especially on court. Nadal played great at Monte Carlo, but will he stay healthy? These days, you never know how Rafa Nadal will play on court because over the past nine months, he was hurt all the time. Even in the first three months, in 2018, he could barely play. However, in Monte Carlo, he looked pretty healthy. But at 100 percent? It was hard to tell until he walked on the court, he was ready to play for hours, he ran fast, he crushed the ball, so heavily, and he was so confident. He must have been so happy that he was playing in the clay again. In Monte Carlo, he won five matches to win the title, and he did not lose a set. He won 10 sets (60 games), and he only lost 21 games. That is damn good. He blew out Dominic Thiem, he pushed Grigor Dimitrov into the ground, and out muscled Kei Nisihikori 6-3, 6-2 in the final. Nadal: the best clay courter, ever. But will he stay healthy over the next two months? He has to, because if he gets hurt again, the 31-year-old will have to go back to the drawing board. I would think that he has to be very careful this season. In 2017, on clay, he dominated, but after he won Roland Garros for the 10th time, he went down pretty quickly. His knees where shot. He cannot beat himself again as he beats up everyone else in the spring, clay-court season. Nadal is playing in Barcelona this week, which he has won many times. It should be tough, though, as he could face Nishikori again, in the third round, and possibly, in the quarters. He could play against the 12-time Grand Slam champion Novak Djokovic or against Feliciano Lopez. They are all long-time veterans, but regardless, Nadal has always known how to be patient. Plus, now, he can move forward and attack. Djokovic has been really struggling, even though he showed some resurgence in Monte Carlo, but he will be super consistent again. It will take a few more months, though. He won’t go away. By the end of the year in late November for the ATP Finals at the 02 Arena on indoor hard courts, Nadal’s knees are pretty shot. Maybe in seven months, Nadal will be 100 percent, healthy wise. He hopes. Rafa Nadal won easily in Monte Carlo, crushing Aljaz Bedene 6-1 6-3. He loves clay — he is an addict — and when he walks on the court, he is already locked in. In the last 10 years, he rarely — and I mean rarely — loses. That’s it. He is the best clay court ever, hands down, but he gets hurt a lot, so now, he is vulnerable. However, this week, if he is healthy, he is the favorite. But, there will be some close matches. 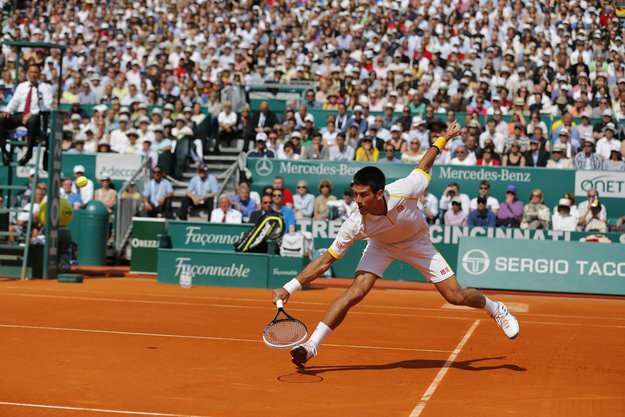 Novak Djokovic finally played well, and it has taken a year — or two years — the Serbian has said. He was pretty lost at Indian Wells and Miami. In Monte Carlo, over the last three days, he is faster, comfortable, and powerful. Will it last? I would think so, but he has to be patient because the 12-time Grand Slam champion isn’t there yet. He beat Borna Coric 7-6(2) 7-5, which was huge, because Coric has been very confident over the past two months. Coric is very steady, and the same goes with Djokovic. They played for two-and-a-quarter hours, but the Serbian reached back and nailed it. Good for Marin Cilic, who beat Fernando Verdasco 6-3 7-6(4). Verdasco does like clay, but Cilic is up and down. However, one this day, he was calm and, when he had the opportunity, he moved forward. His first serve is massive, and his forehand is gigantic. But to win it at Monte Carlo? I cannot see that. Way to go by Kei Nishikori, who bested Daniil Medvedev 7-5 6-2. Nishikori really wants to play as much as he can, but he does get hurt a lot, so he has to be careful…. That is a great win by the Frenchman, Richard Gasquet, who blew out Diego D. Schwartzman 6-2 6-1 in the second round. He has an amazing backhand. … Canadian Milos Raonic is still in there despite nagging injuries. Hopefully, his arms are better, and he won’t think about how sore it is. He is a terrific player, but he doesn’t love clay. On grass and the hardcourts, sure, he can go very deep in the summer. But in the spring, he cannot win in the big events. Including Monte Carlo. John Isner must be thrilled, winning Miami, his best two consecutive weeks ever. But now, it is time for Davis Cup. In Nashville, against Belgium, the Americans are a huge favorite, with teammates Jack Sock, Sam Querrey, Steve Johnson and Ryan Harrison. They are playing indoors, which will probably be pretty fast on the hard court. If they play decently, the USA will win, hands down. Any of the five guys can win it in the singles, given that Belgium are pretty slim. The very good David Goffin isn’t playing because he is still hurt. The two singles player, Ruben Bemelmans and Joris De Loore, will play, and they will have a small chance to win. Bemelmans is very decent, but he is not that great. American captain Jim Courier has chosen Isner and Querrey for singles. On Friday, Isner will face De Loore, and Querrey versus. Bemelmans. On Saturday, it will be Sock and Harrison in doubles against a pair of unknown Belgium players. Courier is darn smart, so if the players listen to what he says, they will move on, quickly. Before that, it looked like Pablo Carreno Busta was going to play, but he became injured. (Everyone gets injured, right?) He pulled out, so David Ferrer has brought him in, and will play the flashy No. 4, Alexander Zverev. The one-time Roland Garros finalist Ferrer loves to grind, and while Zverev likes to chase the balls and whack-em, he cannot get lose his cool, just like he did when he lost in the Indian Wells final against Isner. He must focus. Zverev and Kohlschreiber need to be on fire and enthusiastic. It should be a great contest. Here is another terrific tie: home team Italy versus France on clay, in Genoa. Fabio Fognini is certainly playing in singles, and the captain Corrado Barazzutti chose Andreas Seppi. It will be a very tight match, either way. The French captain Yannick Noah choose the No. 11 Lucas Pouille and Jeremy Chardy, who played pretty well in the past month. Teu have to chop it around and mix it up anywhere you want to. A toss up overall? You bet. Croatia is a serious favorite against Kazakhstan, with Marin Cilic and Borna Coric leading the pack. Coric is playing much better than he did last year. The ‘other’ Kristyna Pliskova shocked the No. 10 Petra Kvitova 1-6, 6-1, 6-3. The next day, she upset Elena Vesnina. On fire, huh? Kvitova can look great, or she can fold. She needs to rest for a while. At least a few weeks. … One more good win: American Bernarda Pera upset Sara Errani. Another American is on the rise. Here goes John Isner, playing fantastic again. The same goes with Alexander Zverev, who was reeling during the first three months, but now the No. 3 is calmer and he is hitting it close to the lines. Isner was totally locked in against Juan Martin del Potro is the semis. As always, his first serve is massive, and his forehand is big and gutsy. His backhand is still medicore, but he can nail it down the line when he wants. Also, he is 6 foot 10 and he isn’t that fast, but he is sharp at the net. The German Zverev won two ATP World Tour Masters 1000s, snagging Rome and Canada in 2017. He also has a huge first serve, is pretty quick, and can go crosscourt, down the line and put in a few good dropshots. He has beaten Isner three times, in 2016 in Shanghai, and last year, in Miami (7-6 in the third) and Rome. The 20-year-old has had a solid event in during the past 10 days, beating David Ferrer, Nick Kyrgios, Borna Coric and Pablo Carreno Busta, without dropping a set. He could be a little bit cocky, but over the past six months, he has learned that he cannot play perfect all the time. He had to push it back and figure it out. Over the past few days, Zverev was very good, sprinting side to side and when he was way off the court, he can nail it for a winner. He was totally pumped up. Isner not only defeated the red-hot del Potro, he also jumped over Marin Cilic and Hyeon Chung. The American has never won an ATP 1000, but he has come close. He is 32-years-old and I am sure he will continue in the next four years. But, when you are in the final at the ATP 100s and/or the Grand Slams and have such a rare opportunity, you have to grab it. While Zverev is a better player than Isner, he will drop down a bittoday and Isner will win it in three tough sets.